Join the Family & Sign up for the Holler Club Rewards! 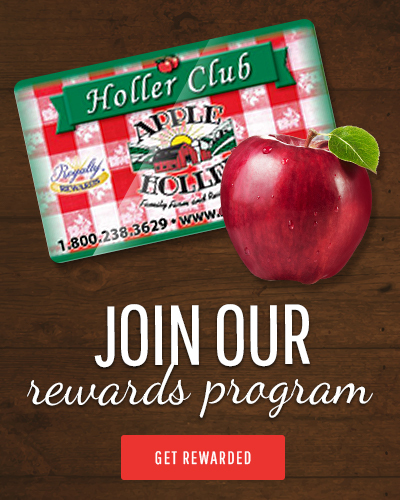 Holler Club Rewards is a FREE program – that rewards you for visiting us at Apple Holler. For every dollar, you spend in our restaurant, gift shop, bakery, or catering you earn cash back in the form of a Rewards Certificate. Being a member is easy… every time you come in, simply present your Holler Club Rewards Card to earn points. Each dollar spent equals 1 point. When you earn 100 points, we will mail you an $8 Reward Certificate ($8 off $20 purchase)! Supply us with your email and earn 50 points. Earn 20 to 50 points for online surveys and reviews. Visit us on Tuesdays and earn double points. There’s no limit to what you can earn! PLUS, You’ll receive other specials and offers throughout the year. We’ll mail a Special Birthday Offer to you and family members. You’ll also be able to take advantage of our Wine Special —Buy 3 bottles, get 4th Bottle Free! As a Holler Club Rewards member, we’ll continue to treat you like family. Sign up for our Email Club below and receive the latest news and great offers throughout the year! Questions or Need to Contact us?